Russian law enforcement authorities have launched a second wave of inspections of non-governmental organizations (NGOs) with the aim of identifying so-called “foreign agents” among them. Prosecutors claim that signs of political activity have already been found in the work of a number of organizations. Russian law enforcement authorities have launched a second wave of inspections of non-governmental organizations (NGOs) with the aim of identifying so-called “foreign agents” among them. At least six organizations in three regions have already been checked, with prosecutors claiming signs of political activity have been discovered in their work. The inspections involved six human rights organizations based in Tatarstan, St. Petersburg, and Nizhny Novgorod. In St. Petersburg, prosecutors paid a visit to a branch of the Soldiers' Mothers of St. Petersburg organization, the Press Development Institute, and also the German-Russian Exchange (an NGO engaged in the exchange of innovative ideas between socially responsible business and the public sector in Russia and Europe). According to representatives of these organizations, the prosecutors came without warning and handed out a notice declaring the initiation of a widespread investigation into the compliance of NGO activities with the law. The supervising authority's requests require that information on recent developments in the organization's charter, its funding, and the conduct of its staff be provided for the years of 2012-2014. "The prosecutors openly told me that we had been brought to their attention due to an article that we put on our site. It criticized Russia's position on the Crimean issue," said Ella Polyakova, the head of Soldiers' Mothers of St. Petersburg. Prosecutors also visited the offices of the organization Agora in Tatarstan and the Committee Against Torture NGO in Nizhny Novgorod on similar grounds. For example, the notification served to Agora said that the prosecutors were interested in an interview given by the organization's leader Pavel Chikov to the Business Online publication in 2013. All of the listed organizations have already provided prosecutors with the details of their activities in 2013. After the adoption in the summer of 2012 of the NGO law, requiring any organization with foreign financing whose work is recognized as political to register as a foreign agent with the Ministry of Justice, the Prosecutor General launched a massive investigation into non-governmental organizations in February 2013. As a result, the Ministry of Justice closed down the association Golos, which had been responsible for monitoring election violations. 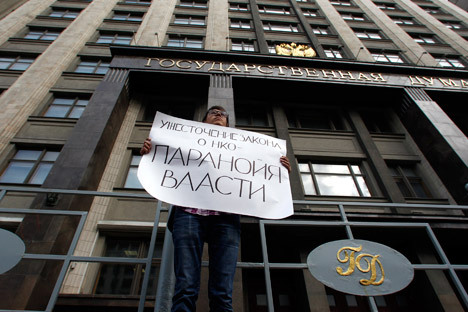 According to the supervising authority, more than 200 NGOs were found in the Russian Federation that fell under the category of "foreign agent", and more than 20 of them have claims being considered in the Russian courts. Only one organization was included on the registry of foreign agents – the Competition Promotion in the CIS Countries NGO. In addition, due to a lack of a precise definition of the concept of "political activity" in a number of regions, prosecutors have demanded that NGOs whose work involves military service members' rights and environmental movements to be designated foreign agents. In April of this year, the Constitutional Court, where human rights activists had filed an appeal, recognized the NGO law as constitutional, but explained that criticism of the government should not be regarded as the main reason for the inclusion of an organization on the registry of foreign agents. According to human rights activists, the prosecutors' visits indicated the beginning of a second wave of large-scale NGO inspections. "I think that the prosecutor's office decided to take revenge since the first inspections did not bring any specific results," said Pavel Chikov, the head of Agora. It is also connected to the revision of a bill introduced to the Duma in April by Andrei Lugovoi of the Liberal Democratic Party of Russia. The amendment proposes to introduce a compulsory order of inclusion on the registry of foreign agents for NGOs. "This law will be discussed in parliament on Friday, so it's possible that prosecutors are preparing a list of NPOs that should be on the registry in the first place for its adoption,” said Chikov. The regional prosecutor's office, which was contacted for clarification, refused to comment on the situation.